It was a spectacular performance, from both Honor Code and Liam’s Map, and a not-so-spectacular performance from almost all of the rest of the field. Let’s look at the splits. 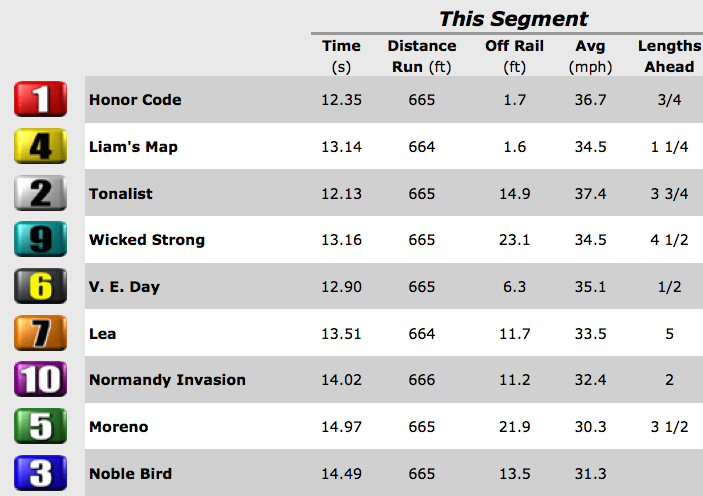 You probably noticed that each chart has a slightly different set of numbers, I’m not really motivated or in the mood the address frequent data discrepancies in racing. So for now let’s acknowledge that they exist and move on (and maybe come back to this topic later). Update: here’s answer for this particular discrepancy from @o_crunk, who works at TimeformUS: “there’s only one time for the race – the leader. All other times are calculated using formulas, that’s reason for discrepancy.” It should also be be noted that Trakus does their own data collection, something I didn’t originally mention because I didn’t want to get too far afield. 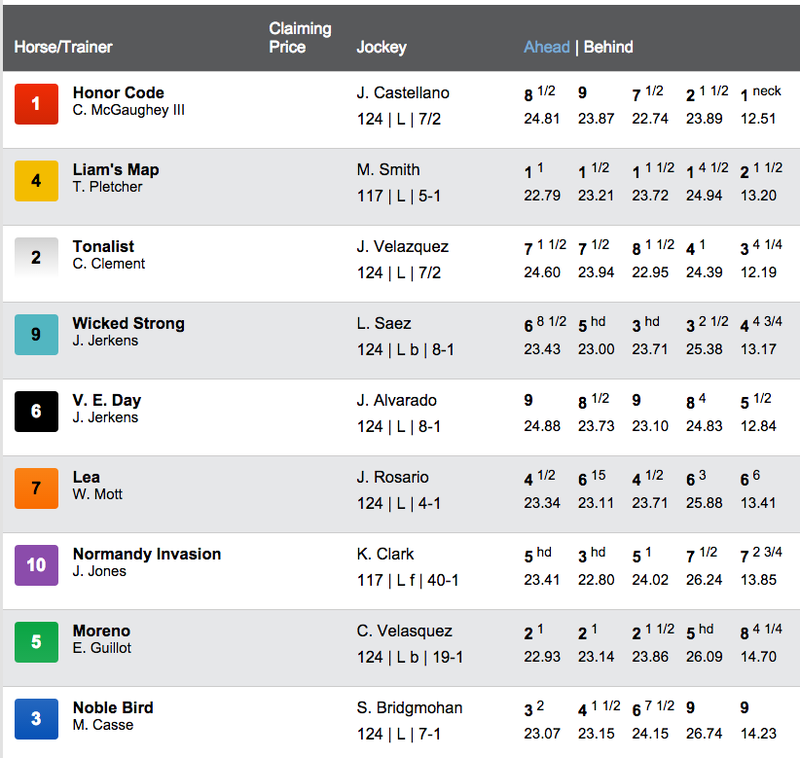 Fans of Tonalist should be relieved that he was moving the fastest in the final 1/8th. Could he have caught Honor Code or even Liam’s Map with more ground? My eye says no and I’m not good enough at math to make a confident projection. I think Tonalist is a fine horse but he’s rarely on my tickets, and I was ready to write him off entirely without the kind of performance he put in yesterday. I still don’t think he’s quite as good as he was last year, but with the right set-up and field I think he could still be a winner, especially at Belmont. I was hoping V.E. Day would do a little better, but looking at the splits he was one of the few that wasn’t tiring at the end, and in that sense it was a good performance, at least to me. Lea was a disappointment though, I’m hoping that effort can be considered a toss but only time will tell. Back to Honor Code for a moment, I saw plenty of ruminations and proclamations that he was a one-turn horse, which is odd if you consider his pedigree and that he’d already won at 9 furlongs. Sure, he got a dream pace set-up, but judging by the Remsen maybe he doesn’t even need a blazing pace. We may never find out with the likes of Liam’s Map, Coach Inge, Constitution, Big Cazanova and other various handicap division front-runners. You’ll notice Moreno wasn’t on that list… (DRF+). At any rate, the top three are pointing to the Classic but likely to take different paths (DRF+). It’s nice to decent handicap division, which will make American Pharoah’s likely lone start against older even more exciting.